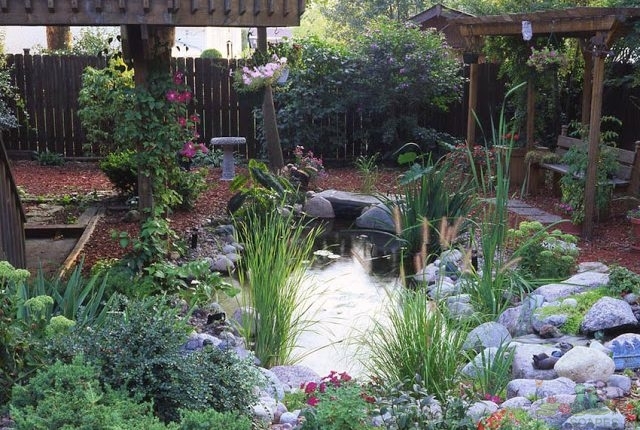 If you’re under the impression that a pond simply won’t fit in your yard … think again! 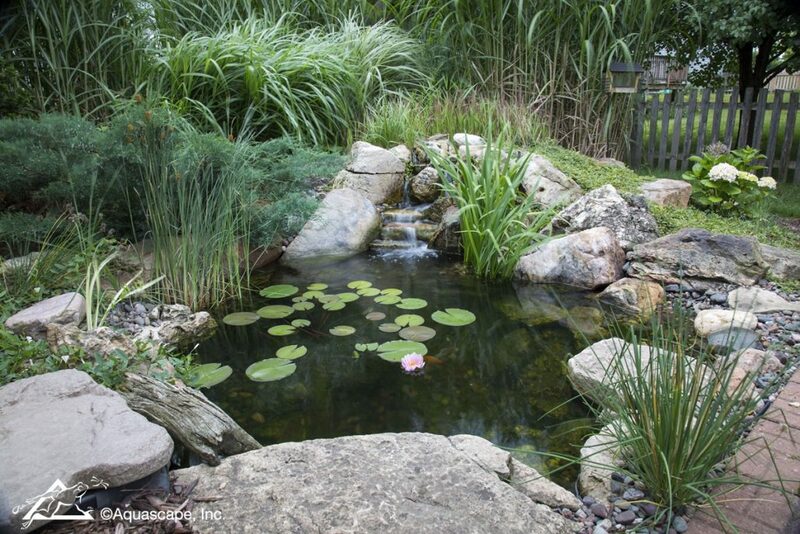 Ponds come in a variety of shapes and sizes and their versatility is what makes them such a great addition to your landscape… in addition to the music of the waterfalls and the birds and butterflies they attract. 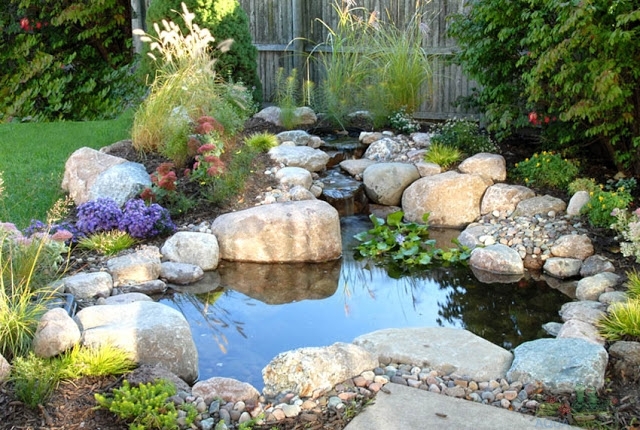 Small ponds are an attractive option for a number of reasons! 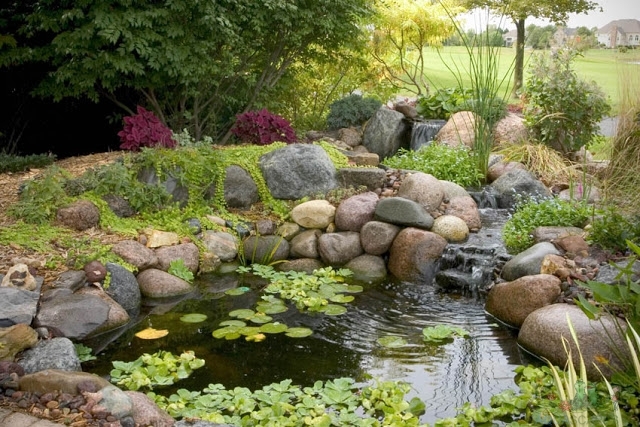 You might not think to use big rocks for a smaller pond, but a few boulders create focal points, softened by aquatic plants. The flat rock on the left is a perfect spot to sit and dangle tired tootsies in the water. 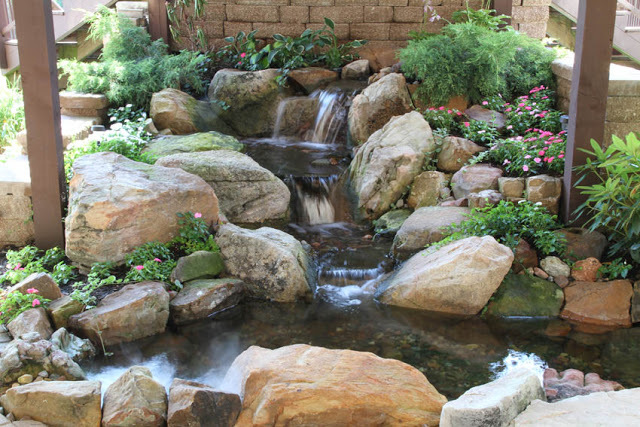 The waterfall is in proportion to this smaller pond, nestled snug against the corner of a patio. This used to be a boring patch of grass, but now the homeowner loves sitting outside to drink in this view. Can you imagine anything more beautiful? An unexpected surprise awaits visitors to this deck. 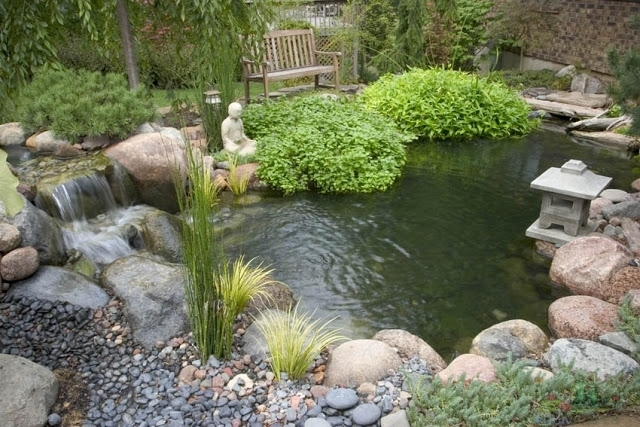 A magical water garden is tucked smack dab into the middle of the deck, carved out specifically for this tiny pond. A stately tree and beautiful mural create an enchanting backdrop. 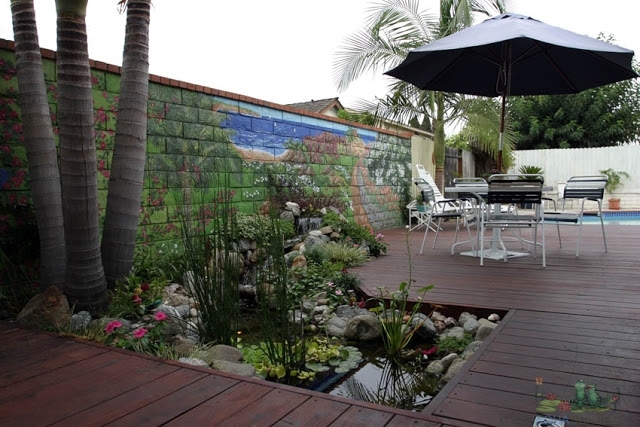 Would you rather mow grass, or spend time relishing the serenity of this backyard oasis? 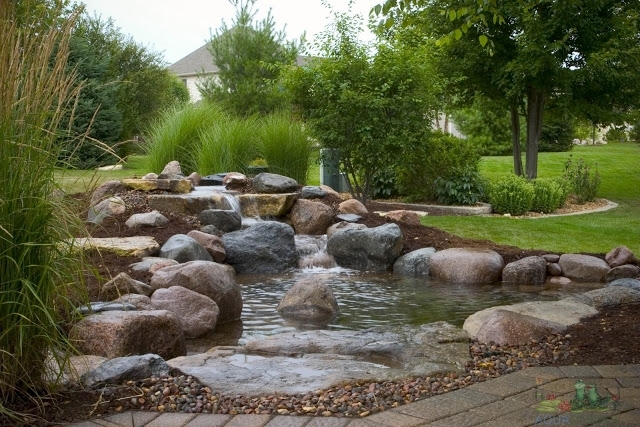 Small ponds (and large) require less maintenance than the same expanse of grass … and it’s much easier on the eyes, too! This newer pond looks like it’s been there for years. 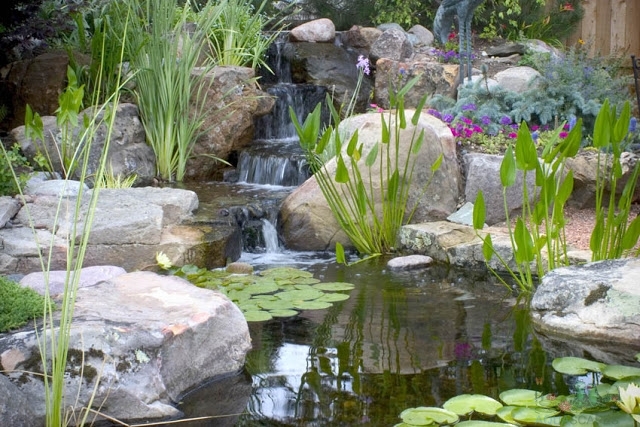 Strategic use of the surrounding landscape was considered when designing this pond and waterfall. A waterfall and winding stream spill gently into this small pond. A mix of aquatic and terrestrial plants mingle with the rocks and water. A variety of grasses creates a soft backdrop for this 6’x8′ pond while creating privacy at the same time. Not sure what to do with that empty space beneath an outdoor staircase? Add a waterfall and pond! Japanese gardens are typically void of color and emphasize the texture and and shape of green foliage. A simple bench beckons you to sit and meditate on the water garden’s simple beauty.